Aptly enough, the terror in The Terror feels more like drowning — like being overwhelmed and subsumed — than the shock and catharsis offered by most horror. This week’s episode sees the loss of Captain Franklin in the most bravado sequence yet, and it’s a killer (no pun intended) for how squarely it puts us in his shoes for the entire experience. It’s rare for horror to be so character-oriented, and rarer still for it to carry through as well as it does here. I’m gonna have nightmares, sure, but it’s worth it for this show. All things told, John Franklin isn’t a bad guy. It’s hard not to be a little mad at him, given how the expedition might not have ended in utter disaster if he’d just listened to Crozier, but it’s not as if he’s acting out of malice. As we see in flashbacks, he’s dealing with as much pressure back home as any of the rest of the men. Failing to cross the Northwest Passage isn’t an option, as what remains of his good social standing depends upon the success of the expedition. Crozier has alluded to Franklin’s past failures once or twice, and the extent to which they presently weigh upon him is quickly made clear. Before the expedition even sets sail, Franklin was dressed down by Sir John Ross (Clive Russell), who told him what we all already know: He’ll end up dead if he’s not careful, and all of his men along with him. Franklin’s wife, Lady Jane (Greta Scacchi), was naturally a little kinder. As it turns out, she’s the one who bought him the capuchin monkey, and she gives him a little bit of a pep talk to go along with it, telling him that the expedition will prove his detractors wrong and restore his reputation. With this in mind, it’s easier to understand why he won’t tolerate it when Crozier tries, once again, to take some precautions. Crozier takes this about as gracefully as possible considering that most of the officers overhear the whole thing, and tells Blanky, the best wingman in the world (and a strong front-runner for my favorite crew member, and yes I know that’s Professor Quirrell), to put together the rescue team anyway. He’ll lead it himself so that the other men can say they were coerced, should there be any trouble. When Blanky notes that Franklin will hate him for it, Crozier shrugs it off. As far as he’s concerned, as long as they survive this expedition, it’ll be worth it. He retires to his cabin to write a letter to Franklin explaining what he intends to do, but again, timing is not on Crozier’s side. A station has been set up to watch for the monster, and Franklin goes to visit to provide a little morale boost. He has Goodsir take a photograph of him and the men in a scene that’s particularly painful when one considers that this kind of ephemeral evidence, if anything, will be all that’s left of any of these people. Then, Franklin ends up staying longer than he means to when one of the men suggests that he ought to be around when the creature is caught. The creature, however, has other plans, and Franklin’s vanity has finally caught up with him. Tuunbaq rips one of the crew straight from the tent, and the ensuing panic scatters the rest of the men, including Franklin. Suddenly, he’s all alone, wandering through the Arctic wasteland, and though the men still on board Erebus and Terror can hear him calling, they can’t see him over the ridges of ice. There’s something horribly disorienting about it all as we cut from Franklin, to the rest of the party, to the ships, but that’s nothing compared to how the scene plays out when the creature finally catches up. The lead-up to Franklin’s death feels like it occurs in slow motion. It’s sickening in a way that’s almost reminiscent of the scene in Bong Joon-ho’s The Host when the grandfather dies — there’s a sense of helplessness and inevitability pervading the proceedings. It’s chilling because it’s been constructed to make us experience it all from Franklin’s perspective, rather than at a remove. 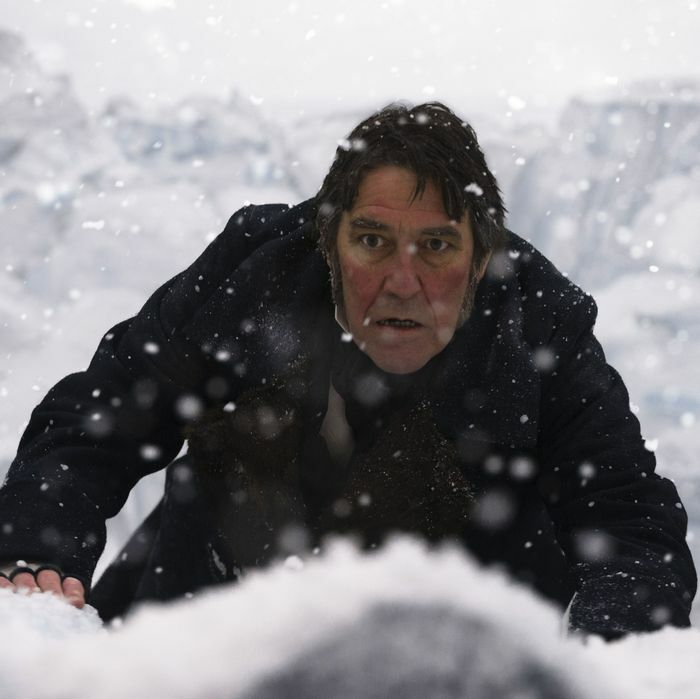 As Franklin is dragged across the snow, we see his perception shift, with the scene’s background changing from ice, to Royal Navy building, and back again. We only realize that the creature has torn his leg off when he does, when the motion comes to a stop, and it’s just as jarring when the creature pushes Franklin into the firehole, causing him to burn alive (what irony!) before the rope to the coal bucket breaks, and sends Franklin plunging into the depths. Just like that, Franklin is gone, Crozier is in command, and the rescue party is a go. • To cop a descriptor from My Favorite Murder, sweet baby angel Goodsir is at it once again. As Franklin’s leg is all that remains of him, he has to decide where in the coffin to place it. What would you do? Put it in the center of the coffin? Where the legs would usually go? At the head? • Trouble is already brewing for Crozier’s reign. After taking a revenge dump in Gibson’s bed for telling Irving that Hickey coerced him (by the way, what do we make of the show’s treatment of Hickey’s sexuality? ), Hickey finds Crozier’s effective break-up letter to Franklin, which isn’t a good look for a new captain. • A few other red flags are cropping up: the men’s inherent distrust of the Inuit people, and how many provisions are rotting due to faulty sealing.